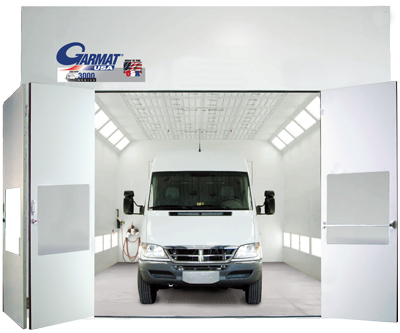 When you need a little more height, the Garmat® USA High Roof Series booths are designed with a higher entry door to accommodate the taller vehicles, namely the Sprinter vans. The Hi Roof Series can be made from any of the existing booth set-ups from the 3000 Series to the Tier1. The High Roof cabin is constructed of durable powder coated fully insulated solid interlocking G-90 galvanized steel wall panels. The High Roof cabins utilize ten-foot wide insulated tri-fold door assemblies with built in personnel access doors and large observation windows for high visibility.